BLC_FIELD Field Represents the entity field (e.g., a Product field) on which to facet. BLC_INDEX_FIELD IndexField Designates if the field will be searchable. BLC_INDEX_FIELD_TYPE IndexFieldType Maps the entity field (e.g., a Product field) to an indexable field type (e.g., a Solr field) for faceting. BLC_SEARCH_FACET SearchFacet Represents a search facet. BLC_SEARCH_FACET_RANGE SearchFacetRange Designates a range of field values for faceting. BLC_SEARCH_FACET_XREF RequiredFacetImpl Cross-references a required search facet to its dependent(s). BLC_CAT_SEARCH_FACET_XREF CategorySearchFacet Cross-references a search facet that should be used for category browsing to a category. 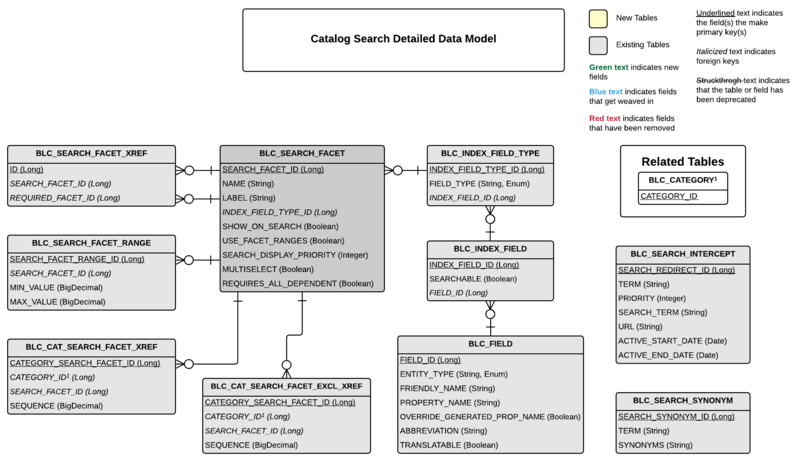 BLC_CAT_SEARCH_FACET_EXCL_XREF CategoryExcludedSearchFacet Cross-references search facets that should be excluded from category browsing. Can be used to exclude a parent/ancestor category's search facet(s) from being used with a child/descendant category. BLC_SEARCH_INTERCEPT SearchIntercept Represents a search redirect (i.e., an HTTP redirect triggered by a search term). BLC_SEARCH_SYNONYM SearchSynonym Represents search synonym.